Welcome! We offer Presa puppies from a generation of superior Presa Canario dogs. We are currently a small and growing Presa Canario kennel dedicated to breeding the highest quality Presa puppies. Unlike many other Presa Canario kennels, we won't try to overwhelm you with an enormous amount of low quality dogs "mixed-in" with a few good Presa Canario puppies. As you can tell by the pictures of our Presa Canario dogs, they are definitely a true representation of the breed. I've been breeding Presa Canario dogs for years and have yet to find a stud Presa Canario dog that looks better than our stud "Titan". Titan's Presa Canario puppies are HUGE! He is truly the total package and what every other Presa Canario male should look like. If you can find a better looking stud Presa Canario dog than Titan, I suggest you purchase one of their pups. Titan's head, chest, and legs are enormous and display the true beauty and power that these dogs are known for. Our Presa Canario females are also very thick and muscular with excellent drive and great structure. We truly believe that big females produce big males. Our goal here at Montreal Presa is to produce the larger side of the breed. 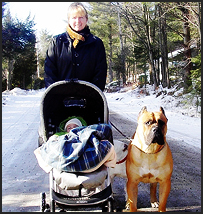 We love our Presa Canario dogs and treat them like family!. We strive to produce dogs that are temperamentally sound, good natured, true to standard, and true "head-turners". I have no doubt that our Presa puppies could win any show that was entered, but we just don't have the time to tour the show circuit. Our Presa Canario puppies grow to be very large, but still have the grace and agility of a cat. We breed mainly Spanish Presa Canario stock, but will utilize other Presa Canarios that meet our requirements. We feel that too many Presa Canario kennels are placing too much emphasis on having only imported stock. If you look at their Presa Canario dogs, many of them are very small and an embarrassment to the breed. Just because a dog has a "Spanish" label on it, doesn't mean that it's without fault. Many breeders already produce great Presa Canario show dogs, but don't have the time or money to invest in the show ring. I have no doubt that our Presa Canario dog Titan could win any show he entered, but we just don't have the time to tour the show circuit. You as the potential buyer need to choose Presa Canario puppies based on your requirements. Don't let show titles or other "double-talk" get you confused! If you're looking for a Presa Canario dog that is a true "one of a kind", with an excellent pedigree, then Montreal Presa is the Kennel for you. We're setting the bar for the next! Presa Canario puppies!! Our Presa Canario puppies average between $3,500 - $4,500 plus shipping. Shipping averages $300.